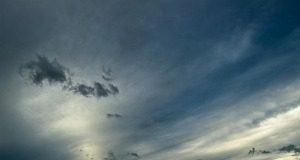 Information technology, advanced automation, and the adoption of practices for energy management are much needed elements to garner quality improvements in energy efficiency. To do this, organizations need to gain greater visibility into energy consumption and then pass it along to operations so the entire organization can benefit from energy reduction. The industrial sector is the leading user of energy in the United States each year, consuming 33% of the country’s energy according to the U.S. Energy Information Administration, (EIA). One way for manufacturers to increase profitability is to lower energy expenditures. The sectors that consume the most energy are chemical production at 22%, followed by petroleum refining at 16% and metal smelting/refining at 14%.While one efficient part of the solution, like a motor, drive, gearbox, or even coupling, will help to lower energy costs, having all components working together to control a process could yield higher energy efficiency than the sum of its components.Today’s energy mindset needs to be one of continuous improvement. Evaluate and then identify the biggest energy consumer, do a system implementation, improve the energy efficiency, and keep monitoring and evaluating.Reducing energy usage while increasing production is a vital balance. The productivity gains of the late 1990s and early 2000s brought automation to the point of increasing capacity, but those gains are now being offset by the increased cost of energy. Energy efficiency will remain a lifetime commitment to ensure the enterprise’s profit margin keeps rising. When it comes to global energy consumption, the world’s total primary energy consumption was 511 quadrillion Btu in 2010, and the United States accounted for 19% of this, according to the EIA.Changes in energy consumption in energy-intensive industries from 2010 to 2035 will range from almost nothing to 0.8% per year, according to the EIA’s Annual Energy Outlook 2012. While that shows stability in usage, it does not show the other side, and that is where costs are going up.In addition, energy consumption by the industrial sector will reflect changes in shipments. Starting from low levels of economic activity in 2010, shipments from all industries will grow through 2035. The report states that industries such as steel will grow by 23% but energy use will decline by 12% due to a shift in technologies. The only industrial sector that shows an increase in energy intensity is refining. Figure 1. Energy efficiency improvements and changes in manufacturing methods and requirements will affect energy consumption. Because energy consumption will be at or around 0.8% across the industrials sectors of the economy, it does not mean that in some areas the percentage of energy consumption can’t go down or won’t go up. For example, steel plants that implement energy saving measures will reduce their usage exponentially between 2010 and 2035. However, in sectors such as automotive, the electric car will use more energy thus driving up the number. The ebb and flow of all the sectors is what gives us the 0.8%, however individually the percentages will vary depending on the industry. At the same time, energy efficiency improvements and changes in manufacturing methods and requirements will affect energy consumption, according to the outlook (Figure 1). Those changes have the potential to allow for greater profitability and stronger advantages for manufacturers. Information technology, advanced automation, and the adoption of practices for energy management are much-needed elements to garner quality numbers for energy efficiency. That is why organizations need to gain greater visibility and understand what their levels of energy consumption are and then communicate that knowledge to operations so the benefit of that information flow will lead to greater energy reduction. What the numbers show is no secret: Energy costs may not decrease, but there is a way to improve the bottom line by cutting back on wasted energy. While an efficient motor, drive, gearbox, or coupling will help, having all components working in unison to control a process will yield better energy efficiency. The control scheme a user employs is often more important than the components. That means energy efficiency must become a mindset, where the manufacturer is always looking for opportunities to improve efficiency. 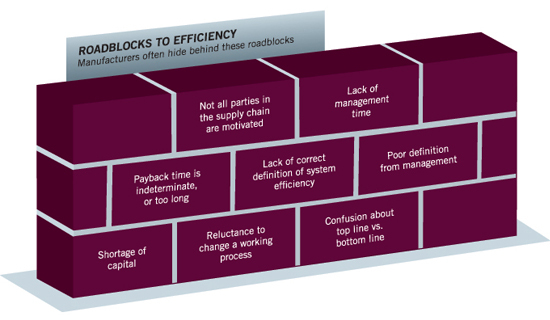 It should to be like continuous quality improvement, where the search for efficiency never ends. The manufacturer will need to go through an evaluation and identification stage, look at the energy uses, and then evaluate how much energy is being consumed. Once the manufacturer finds the largest energy abuser, there will need to be an analysis of the system to improve energy efficiency and then continued monitoring and evaluating. poor definition from management, regarding the importance of energy efficiency. Figure 2. Optimizing the overall system’s mechanics to get the most out of the process is vital to the whole energy picture. One way for a manufacturer to save energy is to look at the machine itself. Using the correct drive system technologies or knowing which motor is the right one for the process is important. However, looking at optimizing the overall system’s mechanics to get the most out of the process is vital to the whole energy picture (Figure 2). Within any process, there are enormous differences in the amount of electrical energy required during individual stages. There are times when machines need to run at full acceleration and then brake suddenly, which will spike power consumption. Using a smart approach by understanding the process, the manufacturer will be able to significantly cut power requirements. To create a total energy solution, one of the first places to look is at the variable frequency drive (VFD). The drive’s components have a huge impact on the overall power consumption of a machine. Electrical drive technology with intelligent, productive control algorithms and high efficiency ratings are vital in keeping energy costs to a minimum throughout the lifecycle of a machine. Figure 3. Electric motors represent almost 70% of the total industrial power demand, according to a Siemens internal study. 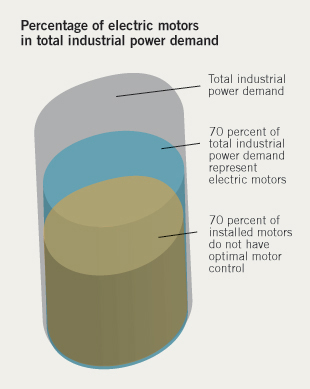 While electric motors represent almost 70% of the total industrial power demand, just about 70% of the installed motors today do not use optimal motor control, according to a Siemens internal study entitled, “Siemens Financial Services Study” (Figure 3). In terms of energy, there are significant savings if the manufacturer runs the motor at speeds of less than 100%. This is what the VFD can offer. In some applications, these drives will pay for themselves in less than a year. In most cases, the payback is around two years or less. One argument against installing energy-efficient motor controls is often that these systems are more expensive. The problem with this common argument is most costs associated with large electric motors are in the energy they use over their lives, rather than in their initial costs and installation expenses. In addition, a VFD can cut down on motor wear, so the motor lifecycle increases. There are process improvements, as well. A manufacturer can control the process much more finely with the drive than with just starting it across the line. When a VFD is connected to a motor, it is possible to adjust the motor’s operational speed. To do this, the VFD takes the incoming power and changes it based upon various inputs. This, in turn, varies the speed of the motor. A Detroit manufacturer of diesel engines wanted to capture the energy generated by its testing and put it back into its own grid to lower utility costs. The company makes the 600-hp workhorse engines that power semi-trailer trucks and must run millions of miles. To ensure they reach that goal, the engines undergo nonstop testing. To test the durability and performance of these engines, its engineers use test stands in a huge, ventilated facility adjacent to its manufacturing plant. A test stand consists of a diesel engine coupled to a dynamometer that applies a load to the engine the equivalent of pulling a 40-ft, fully loaded trailer weighing 20 tons or more. The engine maker uses a dynamometer with an eddy-current clutch, which puts an electrical flux around the rotor of a motor providing resistance to the engine. The test beds cool via a water-to-air cooling system that circulates cool water through the hot machinery. The rotational force generated by the engine pumps the heated water up to the cooling towers on the roof where the cool air absorbs the heat. After running through the cooling towers, the water is ready to cool the system again. The 30 test stands run constantly except for when they connect a new motor for testing. The lab’s testing procedures consumes 2.5 million gal of fuel each year — the equivalent to what 4,000 cars would burn annually. In terms of electricity, they run through 2.1 MW/year. The engine maker ended up replacing the eddy-current dynamometer of two test stands with an induction motor and a four-quadrant VFD. The motor produces torque to load the engine, but it is always being back-driven by the engine. This back-driving causes the motor to act as a generator, providing excess energy back to the VFD. The VFD, with its “active front end,” provides regeneration capability to recover the energy previously wasted as heat and return it to the company’s own power grid. The solution should allow the two test stands to save about $150,000/year in utility costs, a payback of less than four years based upon energy savings alone. The payback is even better once one accounts for the eliminated cost of maintenance for eddy-current clutches and the reduced cost of cooling the water used to dissipate heat generated by the old eddy-current clutches. Given economies of scale in converting the rest of the test stands, the recovered energy will make the engine manufacturer more energy self-sufficient. And the energy cost savings would add up to an additional $2.1 million/year. The company would also prevent about 15 metric tons in CO2 emissions each year. Reduced motor costs: While VFDs are a vital component in a system’s energy consumption, the efficiency of the motor proportionally affects the efficiency of the entire system. A fan is only as efficient as the components powering it, and motors are a key part of all fans, compressors, and pumps. The design of the machine itself does provide some savings, but they are in direct relation to the energy efficiency of the motor, which ends up being a big source of savings. Understanding the motor and being smart about how a manufacturer integrates that into the control scheme ends up being important to energy efficiency. Electric motor systems account for nearly 70% of the entire U.S. manufacturing sector’s electricity usage, according to the U.S. Department of Energy (DOE). In an assessment of industrial motor systems, the DOE found about 40% of the companies it surveyed had made no improvements in fan or pump systems and 52% had not added any kind of controls to more efficiently power variable loads. Knowing the process and capabilities of installed machines and components remains vital to improving true energy efficiency. Properly calculating the size of a motor needed to operate an application will end up saving energy and dropping costs. In one example, if a manufacturer has a conveyor with a 5-hp motor that breaks frequently, the tendency is to replace it with a larger horsepower motor because the 5-hp motor broke and the larger will be stronger. However, most manufacturers don’t realize the larger motor will use more energy than the conveyer needs and lower the conveyor’s efficiency. The manufacturer needs to do an analysis of the conveyer before replacing that motor and, in the end, may find a smaller motor would work just fine. Motors have an operational sweet spot in the torque curve where they operate most efficiently. This might be as low as 75% of full load in some cases. If a user runs the motor at less than this sweet spot or has too much load for the motor, it still takes every bit as much current just to turn the motor, even when it’s unloaded. That results in wasted energy. Sizing the motor properly will result in maximum energy efficiency. Motors and drives garner most attention optimizing a system for energy efficiency, but the system’s mechanical components also play an important role in squeezing the most performance out of each kW of energy. Couplings and gearboxes fall into that category. Knowing the right size and most efficient motor will improve system efficiency from the motor-only point of view. However, manufacturers can apply the wrong couplings to an application and unintentionally undo any savings. When that happens, it not only affects efficiency, it also affects wear and everything else on the other parts of the system. The coupling transmits the power that is present, but if the wrong coupling is in place, it creates problems along the drive system. It can create extra forces that wear out bearings on motors and gearboxes, resulting in downtime and higher maintenance costs. That is why it’s critical manufacturers make the proper coupling selection. There have even been cases where manufacturers felt they needed a new motor because of an exceptionally noisy operation. However, after changing to the proper coupling, the noise problem was eliminated at a fraction of the cost of a new motor. A gearbox is also a mechanical system, and it definitely has an efficiency that either saves or costs manufacturers money. For example, worm gearboxes, which account for over half of the right-angle gearboxes in use today, typically have efficiencies of around 50-70%. This means that up to half of the motor power driving the gearbox is wasted. For a dramatic improvement in system efficiency, replace worm gearboxes with helical bevel gearboxes, which typically have efficiencies of 94-97%. When you make this change, be sure to calculate the new motor power requirements. You will most likely be able to use a smaller motor. An energy-efficient solution relies upon technology working well together to squeeze as much efficiency out of the system as possible, but it also needs people understanding their parts in the process and what they need to do to ensure a finely tuned system keeps running smoothly. From the mechanical side of a solution to the electrical side, the bad news is energy costs will continue to rise. With demand for manufactured products rising, that means energy consumption will also increase. But production costs don’t necessarily have to follow. If a manufacturer taps into its knowledge base and makes sure all technology and people are on the same page, there is great potential to tap into enormous energy savings. Energy is a major cost of any business, and the issue is those costs keep rising. If it isn’t already, electrical consumption will soon be one of the metrics on the control system right next to how much scrap there is, how much utilization time there is on a machine, and how many safe working days there have been. Through strict efficiency in energy usage, the gains achieved, along with the productivity gains from late 1990s and early 2000s will mean manufacturers will be able to improve the bottom line.